The custom Captain America Custom Chopper for sale is #11 of all manufactured and in great condition. This unique motorcycle runs right, shifts right and has plenty of shine. 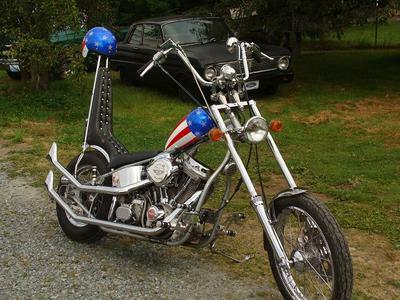 I bought the chopper brand-new so it's a one-owner motorcycle with about 6 thousand miles total on it and a beautiful, patriotic red, white and blue, stars and bars custom paint job. There were plans to make a limited number of 750 of these bikes but they never finished making all of them. So far, no one knows how many were actually manufactured to the best of my knowledge. I am including some extras with the sale including an autographed motorcycle helmet "Peter Fonda". and then come back with questions about the chopper or with comments and comparisons. It will need to have a button sewn back on the seat. I'm selling because I am just too broken up to ride a hardtail bike any more. The Captain America custom motorcycle is located near Seattle WA Washington and I'm asking $20- for it which is good for a limited edition custom motorcycle and the extras. Email me regarding the Captain America chopper using the comments form found below this classified provided by GoGoCycles Used Choppers For Sale . Anyone knowing of someone with the captain america, recently for sale please let me know using the comments form. I want to buy a Captain America CMC Custom motorcycle ASAP! Join in and write your own page! It's easy to do. How? Simply click here to return to CHOPPER Main.